Physical description; 256p. : ill., 2 maps, ports. ; 24cm. Notes; Includes bibliographical references: p.248. - Index. 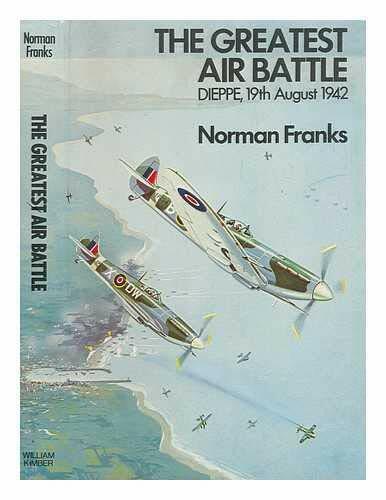 Subjects; Dieppe Raid, 1942. World War, 1939-1945 - Aerial operations, British. More than 25 Years in the Business. Wide variety of Books and accurate Grading. Gerry Kleier Books 4861 Sunrise Dr # 103 Martinez CA 94553 (925) 229-9145. kleierbooks@sbcglobal.net . CWO. Personal Check OK. California residents must pay 9.50% Sales Tax or the Book will not be shipped! You will get an email from ABE asking you to confirm the extra charges. Inquire for shipping charges for books shipped Outside the US or for Priority Mail, Insurance etc. costs. Books held 10 days for payment by check. Overseas orders held 2 weeks . California Residents will be charged 9.50% Sales Tax. If you want a book shipped to a CALIFORNIA ADDRESS, you will be charged Sales Tax. It's the rules! If you object, don't order! BOOKS SHIPPED OUTSIDE of California will NOT be charged Sales Tax, of course. Shipping costs are based on books weighing 2.2 LB, or 1 KG. If your book order is heavy or over sized, we may contact you to let you know extra shipping is required.